Satellite imagery suggests N. Korea may hold military parade soon. April. 12, 2019 08:17. wizi@donga.com. 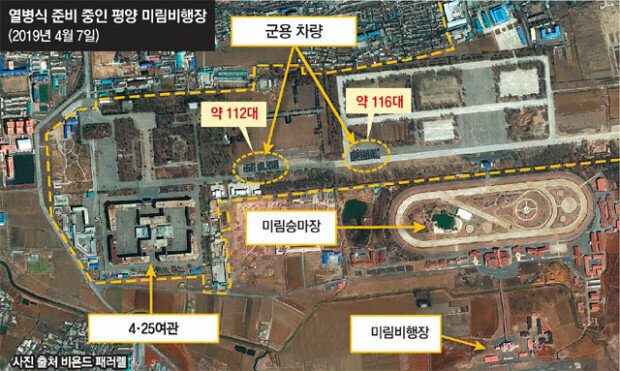 Beyond Parallel, a website run by the Washington-based Center for Strategic and International Studies, published a report analyzing commercial satellite imagery taken on Sunday of the Mirim Parade Training Facility on the east side of Pyongyang. The report said the images suggest that "North Korea may be preparing for a parade to honor Kim Il Sung’s birthday (April 15) or Korean People’s Army (KPA) Foundation Day (April 25)." The imagery shows the presence of 217 military vehicles gathered in two groups at the Mirim Parade Training Facility. "While not conclusive, it suggests the initial stages of a pattern observed previously at the Mirim Parade Training Facility," the report said. According to the report, no significant movements are detected until three to six weeks prior to a parade. "The preparatory activity features the arrival of large numbers of buses and military vehicles," it said. It cannot be ruled out that North Korea will flex its muscles by displaying its ballistic missile forces as it did in past military parades. "In the aftermath of the Hanoi summit, and as (U.S.-North Korea) nuclear negotiations remain stalled, a military parade displaying new weapons systems, including long-range ballistic missiles, may indicate the regime’s retrenchment towards a hardline position and reluctance to denuclearize," the report said.